Minimal impact on performance, even with enormous files. Minimal intrusion into your work. When you're writing code, Atomineer keeps out of the way, and when you're writing comment text, it comes to your aid, quickly and quietly suggesting spelling corrections as you type. Code is full of jargon and abbreviations that don't follow regular language conventions, so spell-checkers often require a frustrating amount of micro-management to keep them up to date with the code you are documenting. Atomineer only applies spelling checks to text that doesn't look like code, reducing this hassle. To minimise the amount you have to teach it, Atomineer includes built-in dictionaries of common programming terms as well as using standard OpenOffice spelling dictionaries. Atomineer Spelling includes built-in English dictionaries (US and UK English), and can also use any dictionaries compatible with the Open Office system. Just double-click the 'AtomineerSpelling2017.vsix' file (or the 2015 variant) that is included within your Atomineer Pro Documentation download and follow the VSIX installer's prompts to install the extension. Once installed, you can disable/enable or uninstall it again from the 'Tools > Extensions and Updates' menu item in Visual Studio. 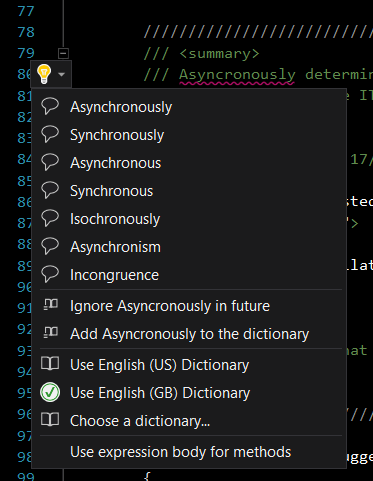 Note that if another spell-checking extension is installed alongside Atomineer Spelling, only one extension will be able to highlight spelling corrections in the code - usually depending on the order in which Visual Studio decides to start up the extensions. It is recommended that only one spell-checker is installed/enabled at any time. In a source code file, move your cursor into a comment or documentation comment block. Any unknown words in that comment will be indicated by a wavy line (purple by default) drawn beneath them. If you move the cursor into any highlighted word, a a light bulb (or a small blue marker in older Visual Studio versions) will appear. Click it (or just press ctrl-. (ctrl-period)) to show a menu of correction and dictionary options. A list of suggested corrections. An option to add the given word to the dictionary so it will be considered correctly spelled in future, and may be offered as a suggested spelling for similar words. An option to ignore the given word in future. It will not be offered as a suggested spelling. Atomineer Spelling works best as a live typing aid: while typing, the current (incomplete) word will display a spelling highlight. If at the end of typing a word the highlight doesn't vanish, type ctrl-. to open the correction menu. In many cases the first word suggested will be what you want, so pressing Enter will correct it. (If not, tab or the cursor keys can be used to select a better correction). This allows typos to be quickly and conveniently corrected as you type, without your hands needing to leave the keyboard. The colour used to highlight spelling errors defaults to a light purple. You can configure a different colour by choosing Tools > Options, switching to the Environment > Fonts and Colors section, and choosing a new colour for 'SpellingError'. Alternative open-source language dictionaries can be found on the OpenOffice Extensions site. From here, download an appropriate .zip or .oxt Dictionary file. (If you download an oxt file, rename it to .zip to access the contents). From this, extract the pair of dictionary files (with extensions .dic and .aff). Copy them to a safe permanent location from which they can be used. In Visual Studio, open the Atomineer correction menu from a highlighted word, select 'Choose a dictionary', then browse to the .dic file. Atomineer Spelling incorporates the excellent open-source libraries NHunSpell and HunSpell, which are both licensed under the GPL/LGPL/MPL.